Submit calendar items for potential posting on this page to info@wvcag.org. One of West Virginia’s biggest strengths is it’s people. This beautiful state is full of passionate folks doing work to keep people happy, healthy, and successful. That’s one reason why, each year, we host an annual awards dinner and fundraiser. This year we’re honoring Paul Sheridan with the Don Marsh & Paul Nyden Public Service Award, and Loretta Young, with the Thomas A. Knight Excalibur Award. We’re also recognizing the 2019 freshman class of progressive legislators (Senators Rich Lindsay & Bill Ihlenfeld and Delegates Sammi Brown, Amanda Estep-Burton, Evan Hansen, Cindy Lavendar-Bowe, Cody Thompson, Danielle Walker, & Lisa Zukoff) as our Rising Stars for their leadership on issues important to WV CAG and our allies. 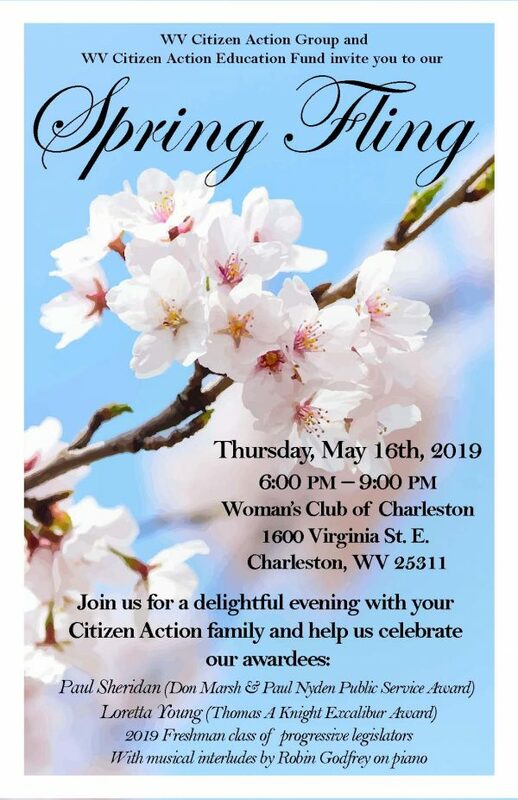 Our Spring Fling also raises funds for help WV Citizen Acton staff, members, and supporters throughout the state continue to fight for clean water, living wages, transparency in elections, and more. And WV Citizen Action is expanding our grassroots organizing presence which means more staff and more work to do. Our goal at this year’s Spring Fling is to raise $25,000. Every penny will help our staff and partners build power and create change throughout the Mountain State! 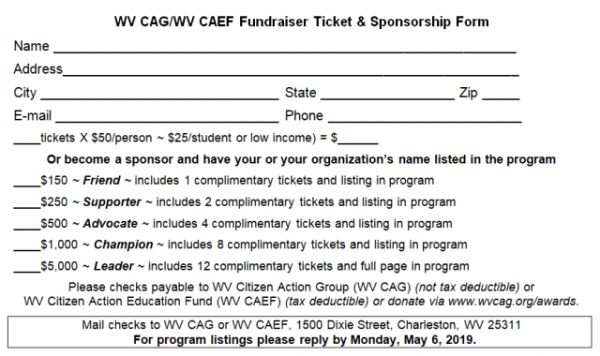 You can purchase tickets or become a sponsor at www.wvcag.org/awards or by sending a check to 1500 Dixie Street, Charleston, WV 25311 (see reply card below for ticket pricing and sponsorship levels). We look forward to seeing you May 16! The U.S. is an increasingly unequal society: the average CEO makes nearly 800 times more than the average worker, and the wealthiest 1% of households own 40% of the wealth. It is impossible to have a functioning democracy when so few people control so much wealth. 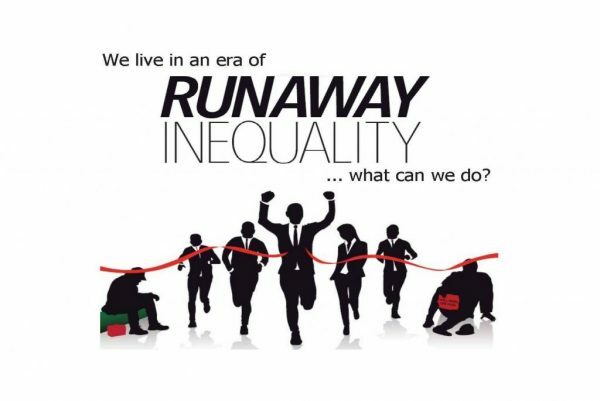 Join us for a free workshop with Les Leopold, director of the Labor Institute and author of “Runaway Inequality,” to explore what inequality has to do with our current political situation and how people across the political spectrum can find common cause to fight for a fair economy. Click here to register. What has made our economy less fair and left most of us less secure? How does the US really compare with other developed countries? What does economic inequality have to do with other critical issues, including education, criminal justice, racism, climate change, foreign trade and war? What concrete steps can we take to begin building a fair and just society?